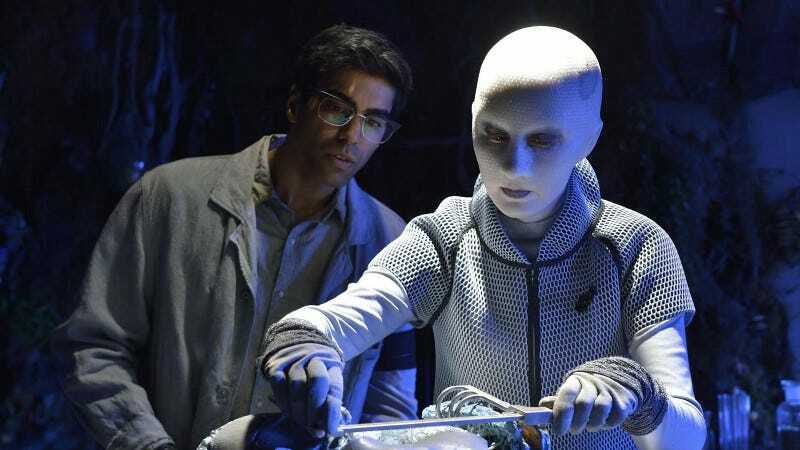 Much of this week’s episode of Defiance deals with the aftermath of last episode’s events and how some people are (or aren’t) dealing with it. Meanwhile there’s a mystery murder beast loose in town and Yewll is on the case. Spoilers ahead. “Ostinato in White”* starts with a female Indogene who looks a lot like Yewll being chased by something. When it looks like Yewll is dragged off by whatever attacked her I was expecting something like “18 hours earlier” to flash across the screen. ** Instead we go to a memorial service for the the townspeople who died in the attack on the NeedWant and in the tunnel during Nolan’s disastrous sortie as well as beloved former mayor Datak Tarr. Alak has no sympathy for his mother even though she has been pardoned because of Datak’s heroic sacrifice. Stahma returns to the Tarr residence in town where her faithful servant awaits. The servant warns Stahma so that she doesn’t run into a couple of bullets by visiting Alak but I still can’t help wondering if she has her own game going on. The Indogene body is brought to Yewll’s clinic where the doctor and Samir examine the corpse. It turns out the body has Yewll’s DNA. Who do we know that has both a sample of Yewll and the technology to make clones? Yewll knows and heads out to check on what the Omec are up to. She understandably doesn’t trust Nolan and Amanda after the last time the three of them and the Omec were together. Now that Irisa seems to have her groove back it’s Nolan’s turn to have issues.He goes on a drinking bender accompanied by a music montage of the people he feels guilt over leading to their deaths in the tunnel. Kindzi shows up in Nolan’s office but before she can play with her food a beastly growl distracts her. Nolan is still sober enough to figure out the Omec have something to do with the mystery murder beast but he isn’t sober enough to do anything about it. And he probably shouldn’t have blown off that call. Yewll gets into the Omec base in the mine but is immediately caught by Kindzi, who is the mystery murder beast hunting clones of Yewll (and some other Votan in town). Kindzi implants a control device in Yewll that effectively makes her Kindzi’s slave. T’evgin isn’t pleased that Kindzi defied him by make clones of Yewll and hunting in town so he puts her to sleep on the Omec ship in orbit. I guess they have powered up enough to do that much. Shockingly, Stahma isn’t welcomed back with open arms by the townspeople of Defiance. When she tries to by ink to apply ritual grieving marks she is refused service. Fortunately Amanda happens to be nearby and pays for the ink. Amanda’s braid isn’t over the past bad blood between them and makes a couple of mean comments. Amanda and a sobered up Nolan confront T’evgin who simply tells them that there will be no more attacks by the mystery murder beast. Nolan still suspects the Omec are behind what happened and vows justice for them. Yewll is still under Kindzi’s geas to protect her interests at all costs so when Samir asks questions about what happened when Yewll checked out the mine he gets a syringe of stuff in the chest (I don’t think he’s quite dead yet). Of course even under the geas Yewll is as snarky as ever. Nolan finally gets around to following up on that call he blew off and finds that Inder, the father of the dead Irathient marksman and embodiment of Nolan’s guilt over what happened in the tunnel, has hung himself. It looks like Nolan’s hallucinatory version of his soldier self will help him through this stretch. While T’evgin dreams of his people, Votan and humans living together in peace with lots of pancakes Yewll has the knowledge of Omec technology and the (induced) motivation to get Kindzi out of stasis. That’s my guess anyway. I was taken out of the scene every time I saw the Irathient rifle because it was obviously a PPSh submachine gun. Since everyone thinks Datak is dead (and he didn’t appear at all this episode) either he has managed to get out of the area around Rahm Tak’s camp or no one bothered to actually go out and look. I considered titling this post “Two Yewlls for Mister Nolan” but thought that was a bit spoilery. *Ostinado means a continually repeated musical phrase so draw your own conclusions. **I had already seen that particular (and overused) device of starting in the middle then flashing back used twice in the last couple of days.